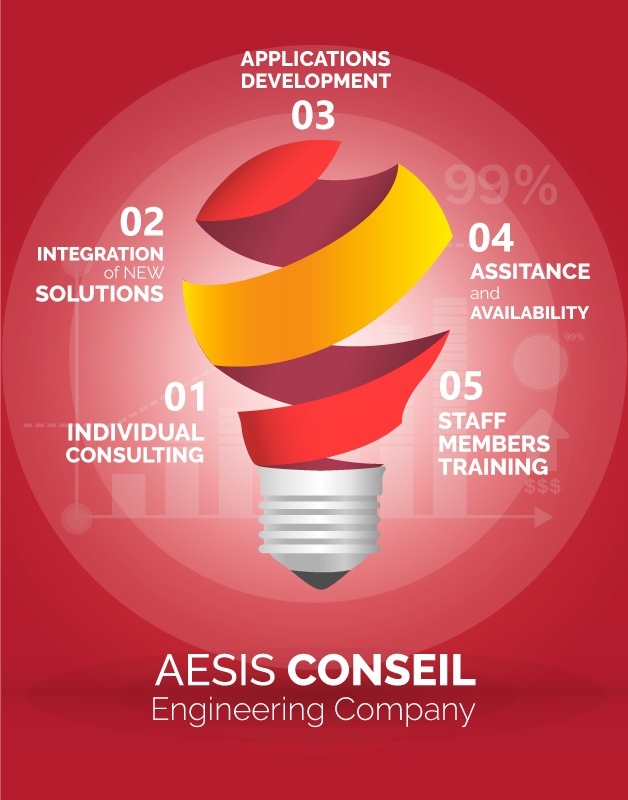 Aesis Conseil is a software engineering company. Our main activity is the integration, the distribution and the open use of our software. Created by two operational partners, the company has relevant business and product expertise with the help of its ten collaborators. Aesis conseil emerged from a desire to prove that these days, in the IT sector, we can work differently, more efficiently and less constrained by some software publishers. Assessment and consulting, the first step to analyze your needs and to find the right solutions for your organization and the best way to upgrade your information system. Implementation of new solutions into your existing IT infrastructure, it is not always possible to change everything, and you must be able to amortize your previous material, software and human investments. Developing applications that suit your needs and take into account the specificities of your activity and your organization. Assistance and availability, to suggest new solutions, solve problems, optimize your tools and assist you throughout their life cycle. Staff training, to allow your staff to understand and use the work tools efficiently and to give the possibility of following their evolution over time, with all the necessary skills. In 2014, Aesis Conseil receives the “Social enterprise” label, attributed to companies that step up their efforts to carry out their economic activity while pursuing social functions. Aesis conseil signed the “neighborhoods and companies” charter that encourages local economic, social and cultural development of priority neighborhoods. Our partnership with the local mission (MIAJ) gives us the opportunity to welcome young people looking for a professional project. We use free software in areas where it reliable and performant. Allow our customers to save on licenses and therefore on the costs of IT infrastructure. When using a free solution is not possible, we make sure to choose the best available solution. Provide our customers with an advice that is independent of any publisher or IT manufacturer. of knowledge, by adopting an open-source software philosophy. honesty and unity with our customers, collaborators and partners. and complete protection of your collaborators’ sensitive data. with the implementation of an eco-development software policy.